Reprint. Originally published: London: Jonathan Cape, 2018. My Year of Rest and Relaxation is a non-negotiable in your holiday carry-on this summer' VogueIt's the year 2000 in a city aglitter with wealth and possibility; what could be so terribly wrong?Our narrator has many of the advantages of life: Young, thin, pretty, a recent Columbia graduate, she lives in an apartment on the Upper East Side of Manhattan paid for, like everything else, by her inheritance. But there is a vacuum at the heart of things, and it isn't just the loss of her parents in college, or the way her Wall Street boyfriend treats her, or her sadomasochistic relationship with her alleged best friend. 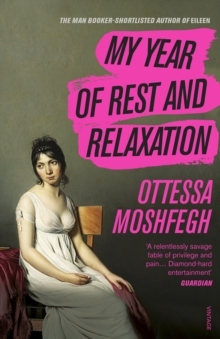 Blackly funny, both merciless and compassionate - dangling its legs over the ledge of 9/11 - My Year of Rest and Relaxation is a showcase for the gifts of one of America's major young writers.